I was struggling with what to write about today, just because I haven't taken any pictures this week and haven't done anything entertaining like poop my pants in public. Then it struck me that I'm always amazed by how the Internet keeps seeming to shrink my world little by little every so often. I'm not sure that I ever mentioned it, but after I met my stalkers in Nashville and then Friended them on Facebook, we realized that we have a friend in common: one of the pastors I grew up with AND WHO PERFORMED OUR WEDDING CEREMONY. And then just last week, I was emailing with Tara, the blogger who made our Family Rules sign, and we realized that one of my high school friends who was in my youth group is a friend of hers ... a very close friend. It's just so bizarre! I was born in Hartsville, S.C., which is a little town near Florence. Totally coincidentally, my sister- and brother-in-law (Jonah's grandparents) moved to Florence several years ago, and Gerry now works in Hartsville. I did a Google search for images of Hartsville, and although it's grown since I lived there, it apparently hasn't grown that much. ;) Couldn't find much to share with you. Southport is the first town I remember, home to the first house I can still completely trace in my mind. I was 3 when we moved there, 8 when we moved away. 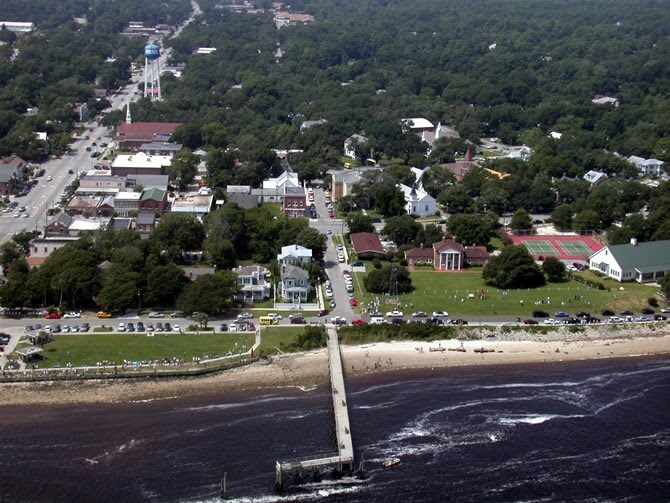 Situated at the mouth of the Cape Fear River, just south of Wilmington, it was a beautiful, peaceful town when we lived there. It's grown by leaps and bounds since we left, but it still has so much charm. We used to fish off the long pier at the center of town. I would name all the fish in the bucket while we drove the couple of miles home, and then cry when they went in the frying pan for supper. I'd still do the same today. 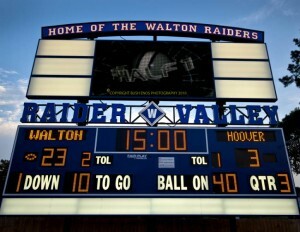 I didn't know we'd only be in Marietta for two years, 3rd and 4th grades, when we moved there. I made some close friends, as you do when you get to the middle of elementary school. We lived literally right next door to our neighborhood pool, only having to run across our side yard to get there. Bliss! Moving to a new city the summer before 5th grade was tough. Everyone already knew everyone else, and I remember having trouble finding a "best friend." It was good to be there for 5th grade, though, because that meant that when I moved up to middle school the next year, I knew some people. Maybe only 20 or 22 of them, but that was better than knowing NO ONE. We were very, very involved with First Baptist Church downtown, and I loved my youth group and youth choir. Middle school itself was an up-and-down, highs-and-lows experience, as I imagine it is for most people. Two of my most vivid memories in Raleigh are of watching St. Elmo's Fire at my friend Erin's house during a sleepover (Hi, Faithful Reader Erin!) and watching Top Gun at my friend Missy's house during a sleepover. At our friend Sarah's house, I played Ouiji Board for the first and last time, and I was dropped while playing Light as a Feather, Stiff as a Board. Also all during a sleepover. Apparently that's what we did on the weekends. Additionally: many memories of swim team. If it was tough to move to a new city the summer before 5th grade, it was even tougher to move back to Marietta the summer before 9th grade. They'd rezoned the schools because they built a new high school, and the only person I really knew from elementary school was zoned for the new high school. But I met several friends in my school who became life-long friends (Hi, Monica! ), even more friends in my youth group who are still so significant in my life and some who read my blog!, and experienced my first meaningful crush, first love, and first multi-year dating relationship. Marietta will always be special to me, because so many radically significant things happened to me there. I grew up, made mistakes, loved, lost, learned to drive, grew my faith and sang my heart out there. When I came to Birmingham to attend Samford University, I wanted to stay. I never planned to graduate and start interviewing in other cities. I wanted to live somewhere that would be home forever. I wanted to marry here, to raise my family here. I desired -- CRAVED -- stability, familiarity. Going to the grocery store and running into three people I know. Hearing a honk and looking over to see somebody from church waving at me at a stoplight. Being a "regular" at a restaurant or two. I love that Nathaniel has been in the same school for five years and knows everyone in his grade. I love that Grayson has been able to mentor the same Cub Scout den for several years, getting to know the kids as well as their parents. I love that I have two scrapbooking groups I crop with on a regular basis, a Bunko group full of fun women that I fellowship with once a month. My dad's sister and family live in Marietta, Ga. My uncle was in the military and they moved there in the early 90's. Their last name is Parrot. They have four kids; Robert, Kenny, Dorothy, and Timothy. Know any of them? Kenny was killed in a motorcycle crash, but I believe that was before they moved there. Oh I forgot, Dorothy now lives in the Birmingham area.